The first section of the paper discusses the importance of infrastructure. It concludes that adequate infrastructure is necessary for economic growth and that it can contribute to reduction in inequality. The second section of the paper summarizes the lessons learned from infrastructure reform in Latin America and in the “transition” economies of Eastern Europe and the former Soviet Union. The lessons from Latin America show the importance of introducing competition where feasible, regulating where monopoly power exists and encouraging private participation. An important lesson from the “transition” economies is that it is necessary to introduce mechanisms to avoid asset stripping and tunneling. While lessons from other countries can be useful, the specific reforms in Cuba or any other country must be modified to fit the local conditions. The third section analyses the present situation in Cuba, a difficult task given the paucity of data. The power situation, which was dismal in 2004–06, has improved significantly, and the frequency and severity of blackouts has been reduced; however, the relatively small gensets that have been installed throughout the island are costly to operate. Telecommunications coverage is very low for a country of Cuba’s level of income and the water sector provides low quality services; sewerage disposal in general is a main source of contamination. The fourth and final section establishes an agenda for the reform of the three sectors designed to maximize private sector involvement. Private sector participation is easiest in telecommunications, somewhat more difficult in power, and generally most problematic in water. First steps in a reform agenda would be to draft a strategy, develop the enabling legal/regulatory framework for the sectors, and establish the regulatory institution. At the same time, mechanisms should be established to curtail asset stripping and tunneling in existing enterprises, principally Unión Eléctrica. However, the U.S. Agency for International Development (USAID), the World Bank and other development institutions generally describe infrastructure more narrowly. This narrower definition of infrastructure comprises utilities and certain “public works.” Specifically, utilities include power (electricity); telecommunications; piped water supply and sanitation; piped gas; and piped heat. Public works include transport infrastructure including highways, secondary roads, rural roads, railroads, urban transport, ports and waterways, and airports; and major dam and canal works for irrigation and drainage. All those infrastructure services have the characteristics of networks. Therefore while the technologies are different, there are a number of common elements such as the presence of network externalities, essential facilities, and economies of scale, density and scope. This paper deals with power, telecommunications and piped water supply and sanitation (water and sewerage). One common element shared among the sectors is the need for economic regulation to avoid the exercise of monopoly power, at least within certain segments of these networks. Beginning with Chile, Latin America set the pace for infrastructure reform in the telecommunications, power and water sectors. The reforms in Latin America were carried out in the context of essentially market based economies that had fairly large levels of government intervention. So while the infrastructure reforms were difficult, the general environment in which they took place was reasonably favorable towards private sector involvement. Cuba, on the other hand, has a very unfavorable environment for private investment. For example, Cuba ranks 156 out of 157 countries in the “Index of Economic Freedom” developed by the Heritage Foundation and the Wall Street Journal (Kane, Holmes and O’Grady 2007), just ahead of North Korea. Therefore, it would be naive to try to attempt to implement in Cuba the Latin America type of reforms without modification. We believe that while Cuba can reach an end state that approaches the best of the Latin American models for infrastructure reform, such as those of Panama for power, Guatemala and El Salvador for telecommunications, and Chile for water, the path for reaching that end state must be informed by—and benefit from—the lessons from the countries of Eastern Europe. In Cuba it will be necessary to protect existing state-owned enterprises, principally Unión Eléctrica, from asset stripping and tunneling that prevailed in the transition countries and that resulted in monumental losses. Previous papers by Belt (ASCE 2000, 2006) have summarized the main lessons learned from the power and telecommunications sector reforms in Latin America. Excellent summaries of the lessons from power sector reforms are in a book by Hunt (2002) and a paper by Bessant-Jones (2006). 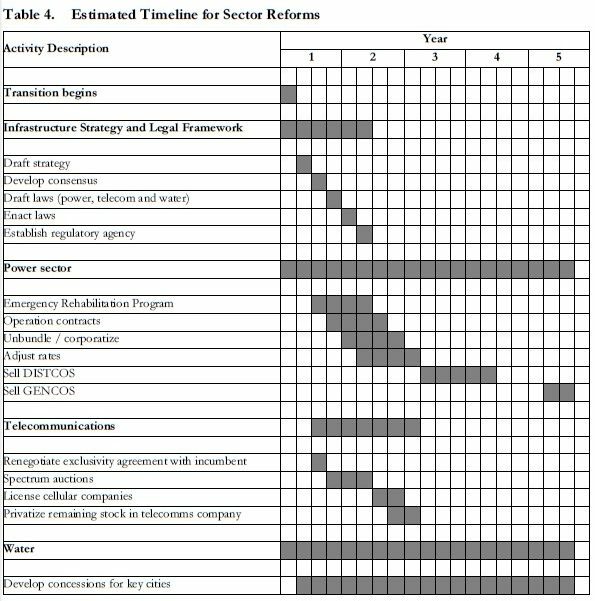 The main lessons from the water sector reforms in Latin America are summarized in the outstanding paper by Vivian Foster (2005). The main sectoral lessons are summarized in Table 1. • Encourage establishment of new enterprises mostly by improving the enabling environment. Establishing discipline in existing SOEs is particularly important for infrastructure because of their large size and systemic effects. For example, the electric utility (Unión Eléctrica) has sales valued at economic prices $2.0 billion. Main lessons related to discipline include: (1) hard budget constraints on existing organizations should be established as soon as practical. Obviously, tariff increases are necessary; and (2) systems for monitoring and influencing managerial behavior to reward efficient stewardship of assets and to discourage tunneling and asset stripping should be established. Performance-based management contracts (operations contracts) can play a role. • Managers and employees should get financial gains from better performance. These lessons clearly indicate the viability of a broad diversity of business options for successful private sector participation in difficult settings. A schematic representation of these different modalities is given in Table 2. A basic lesson learned from transition and Latin American countries is that it is easier to develop the legal/regulatory framework than to develop adequate institutions. The institutions include the relevant ministries in charge of policy-formulation and the regulatory agencies. The latter must be independent from the former as well as accountable for its actions. In the case of smaller counties with limited experience in regulation, it will be more efficient and effective to have a multi-sector regulator, an approach taken by a number of countries in Latin America and the Caribbean, including Panama, El Salvador and Jamaica. Given than the sectors are quite different, a typical multi-sector regulator would have legal, economic and administrative departments providing support across all sectors but will also have specialized departments dealing with water, power, telecommunications, etc. • The executive and legislative branches of government involved in selection. Independence, however, has to be accompanied by accountability. This requires (1) strong provisions prohibiting conflicts of interest; (2) established rules and procedures for appeal and overturning decisions of the regulator; (3) public availability of budget and scrutiny (usually) by Parliament; (4) external audits; (5) permitting removal for just cause; and (6) open hearings with participation by the regulated industries and the consumers. The power sector in Cuba is characterized by an aging and obsolete infrastructure, poor levels of energy efficiency, a high level of electricity losses of about 30% in transmission and distribution, and a heavy dependence on liquid fuels for power generation. Since the dissolution of the Soviet Union, Cuba stopped receiving large transfers, which were estimated at $5.0 billion annually, and then plunged into an economic crisis. During the time known as “Special Period,” the Cuban government was unable to pay for oil imports for power generation or maintain the facilities. However, Cuba signed Production Sharing Agreements (PSAs) with foreign oil companies and increased its domestic production of crude oil and began using the high-sulfur, heavy oil as plant fuel for power generation, thus significantly damaging the power plants. Finally, a series of 16 hurricanes over the last 15 years damaged the power transmission and distribution network. Information on the details and exact locations of the newly installed power plants is not available. Nevertheless, it is a well documented case of the “energy revolution” that approximately 2,000 new small gensets, adding up to 1,200 MW, are being installed throughout Cuba, replacing and complementing larger and older power plants that have suffered chronic breakdowns due to lack of maintenance, limited investments, damage from heavy Cuban oil, and many years of prolonged operation. However, the installation of these small capacity generators is an unconventional solution to the power sector in Cuba, and it has advantages and disadvantages, both in the shortterm and in the long-term. On the positive side, the generators were rapidly installed and put in service, thus offering an immediate solution to the problem of blackouts and popular discontent. Additionally, this solution may be more robust in the aftermath of natural and man made disasters that could damage the transmission network. The genset “solution” has many problems. First and foremost, the unit cost of electricity per kWh is very high if diesel is valued at its opportunity cost.4 Second, it is difficult to provide maintenance and fueling services to a multitude of generators installed throughout the Island. Finally, it will be difficult to dispatch these generators to ensure an instantaneous balance between supply and demand. A more rational, comprehensive, and longterm solution to the power generation problem in Cuba is still outstanding. Table 3 presents a list of the major power plants in the country and their nominal capacities. Cuba’s present electricity market has a total of approximately 3.3 million customers, composed of 45% residential customers and 55% non-residential customers. These figures include commercial, industrial, service, and state enterprises. Assuming that the older plants will not be replaced and continue working at a plant capacity factor of 40%, and the newer plants at 50%, the combined power generating capacity may increase the annual energy production in 2007 to an estimated 21,500 Gigawatt hours (GWh), with an average peak hourly demand of 2,450 Megawatts. Thus, under that assumption, the existing levels of installed capacity should be sufficient to meet the existing market demand. However, there is still the issue of heavy system losses of 30% in transmission and distribution, and the need to secure refined oil products given the 92% dependence on liquid fuels for power generation. To complement the scope of the “energy revolution,” the Cuban government introduced strict energy saving measures and enacted legislation to simultaneously improve conservation, reduce consumption waste, address increasing energy demands, and penalize electricity theft. New efficiency programs for the production, transmission and delivery of electricity were incorporated into these measures. Today, there is new legislation imposing severe penalties for the theft of electricity which include imprisonment for up to eight years for a third violation. Another important and recent initiative is a shift on the promotion of renewable energy sources, notably wind and solar. As a result of these activities, there is an improvement in the Cuban power sector compared to the previous year. In only one year, power outages became less frequent, a significant number of obsolete, high-energy consumption household appliances were replaced, and many small generators were added. These results represent a considerable advancement, achieved at an estimated cost of $800 million. However, these milestones are only an indicator of a short-term improvement in the sector as there is still a need to modernize the entire power sector infrastructure. Furthermore, and as stated by Cuban authorities, the real focus of the “energy revolution” is to instill a culture of energy savings in the Cuban population “… through the introduction of high energy efficiency household appliances, the application of a graduated fee/fine structure in the domestic sector, the rehabilitation of the national transmission and delivery system, and a concerted effort to minimize losses at the production inputs of energy generation …” (Benjamin-Alvarado, 2005: 15–16). There is no clear indication, however, that the Cuban population has embraced that energy-saving culture. On the contrary, the mandatory nature of the acquisition of energy saving appliances and efficient light bulbs, coupled with cost prohibitive fines for the majority of the Cuban population, may be interpreted as a new set of coercive and authoritarian policies that may now be in effect in the energy sector. Finally, the “energy revolution” is built upon the premise of available and subsidized refined petroleum products from Venezuela as its main energy security foundation. If—and when—these subsidized imports end, the Cuban economy is likely to experience another oil price shock and product supply restrictions. The long-term success of the “energy revolution” is yet to be proved. The institutional base of the Cuban power sector is complex, and follows the bureaucratic structure of the centralized economy of the Cuban government. (Pérez et al, 2005). The Ministry of Economy and Planning (MEP) rules the energy and economic policy of the country, and presides over the Energy Council (CAAE), which is the body in charge of controlling the Program for National Energy Sources and energy efficiency, fostering renewable energy sources, and elaborating laws and legislation to improve energy efficiency in the national economy. The Energy Council in turn is made up of 16 other government agencies with some indirect responsibilities on the energy sector, such as the powerful Sugar Ministry (MINAZ), the Ministry of Agriculture (MAG), the Ministry of Basic Industry (MINBAS), and others. The Energy Council, under the leadership of MEP, runs the operations of the national Electric Utility (Unión Eléctrica) and Cuba Petróleo (Cupet), which are the main government institutions responsible for the administration of the electricity and fossil fuel sectors, and all their related activities of production, transmission, distribution, and commercialization. Their operations are intimately related as more than 90% of the energy produced in Cuba depends on oil products as power generation fuels. MEP is also in charge of State Energy Inspection and regulatory enforcement throughout the country, acting as the de facto regulator of the energy sector. In addition, the Energas joint venture with the Canadian energy and mining firm Sherritt Ltd., operating in Matanzas, and Genpower, another independent power producer in the Isle of Youth, contribute to oil production, electricity generation and distribution. The National Assembly of People’s Power has an Industry and Energy Commission that represents the legislative power. Finally, all the government agencies, including the Energy Council, report to the Executive Power through the Council of State, which is made up of Ministries within which the above-mentioned energy related structures are inserted. The ultimate authority remains with Fidel Castro, President of Cuba, and the head of the Council of State and Ministers. Cuba’s power tariff system is also very complicated. There is a multitude of tariffs, most of which, however, do not reflect the actual costs of the power supply, in particular to residential customers and low energy consumers. This incorrect pricing led to an improper allocation of energy use and energy technology, and prompted the Cuban government to develop a new tariff system that more closely approximates economic reality. Today, the basic structure of the existing price system makes a distinction between rates in local pesos (“Tarifas en Moneda Nacional”) and rates in US Dollars, and their application differs mostly with respect to the customers being served. Cuban homes, the public sector, agricultural businesses, and the sector of industry not producing for the dollar markets pay their power bills in Cuban pesos. Foreign companies, employees of foreign companies, diplomats, and joint venture companies (empresas mixtas) are billed in U.S. dollars (or convertible pesos) at full cost recovery rate for their power. As the prices in dollars and Cuban pesos are nominally roughly equal and the exchange rate for dollar and Cuban pesos is around 1:26 (April 2007), the actual prices for power for the two groups are much different. 5 The basic structure of the electricity rates is described below. • The first 1,200 kWh per year (100 kWh per month) cost 0.09 Cuban pesos per kWh. • Each additional kWh costs 0.2 Cuban pesos for up to a total of 3,600 kWh/year. • Above 3,600 kWh per year, each kWh costs 0.3 Cuban pesos. • The rate for customers that pay in dollars is US$ 0.1215 per kWh across the board. Cuban industry is charged a combined “power price” tariff with various time zones. The three zones are the peak load time (6 pm to 10 pm), medium load (6 am to 6 pm), and low load (madrugada, 10 pm to 6 am). The actual power price is based on a contractual purchase commitment. For example, an industry customer with two-shift production and a monthly purchase commitment between 1,000 kWh and 2,999 kWh would pay 4 Cuban pesos per kWh per month. If the ordered amount is exceeded during peak times, the difference between the actual load and the ordered load costs 12 pesos per kWh. The “work price” then increases during peak load hours. The power prices for industrial customers paying in dollars for the comparable tariff are US$0.09 during peak loads, US$0.04 during medium loads, and US$0.03 during low loads. Foreign industrial customers pay US$0.12 per kWh. (SEPCO, 2005). • The power prices for all customer groups should be adapted to the actual costs for power generation and distribution. Measures to accommodate for the incomes of Cuban families and industries that pay in pesos should be implemented as the cases merit. • The structure of the tariffs for different customer segments does not reflect the true costs of power generation and distribution, therefore a unification of the full cost recovery tariffs would make economic sense. • Given these rates, energy efficiency programs make both economic and environmental sense, as the costs for the import of these energy saving technologies would quickly be paid off by the import costs for the oil burned in Cuban power plants. International communications and Internet access are highly restricted in terms of prohibitive rates, actual connections, and the number of governmentowned Internet sites that Cuban citizens can “visit” to browse the “local Cuban” intranet which only offers access to government-approved web sites. Access to the world wide Internet is limited to a select number of government institutions, the diplomatic sector, and approved foreign businesses. It is available for tourists at the main hotels, but they must pay for the service approximately $5 for 30 minutes and a common Cuban citizen cannot “legally” buy a personal computer and request a service from an Internet Service Provider (ISP). For that common task, a Cuban needs to have a private telephone line and a government permit, and once it is obtained, must also be able to afford a monthly service rate of approximately $35.8 Radio stations and TV channels are state-owned and operated throughout the country, and private broadcasting is prohibited by Cuban law. The national telecommunications infrastructure in Cuba consists of a network of approximately 2,100 kilometers of fiber optic lines, a digital microwave network with 1,840 channels, and an outdated coaxial cable trunk system, using an X.25 network. There are currently 896,000 fixed line services in the country, of which 768,000 are operating with existing customers. Ironically, the Cuban regime argues that it is attempting to reorient the economy away from traditional sectors such as sugar, tobacco, and mining, and trying to convert Cuba into a “knowledge economy” with an emphasis on high-tech and service oriented sectors, such as medical services, bio-technology products, and tourism. But developing these modern economic activities, while restricting communications and Internet access, seems to be highly contradictory, as these industries and service sectors demand state of the art telecommunications technology and fast connectivity to information. Telecommunications services are provided by the Empresa de Telecomunicaciones de Cuba S.A. (ETECSA), a mixed capital company that is owned by the Government of Cuba, and managed by the Ministry of Information and Communication, with a majority share of 73%, and by Telecom Italia, with the residual 27%. The monopolistic services of ETECSA include telephone, internet and wireless services, and at the present time, it is the only provider of telecommunication services in Cuba as result of an exclusive, 20–year right to operate in the telecommunications sector issued in 2003. With revenues of more than $400 million in 2005, ETECSA is one of the most powerful and visible companies in the country. It is under the direct control of the new Minister of Information, Technology and Communications, Ramiro Valdés, 74, a sinister military commander, former Minister of the Interior, long-time member of the Cuban government, and loyal to the Castro brothers. His recent appointment has been the only ministerial appointment that Raúl Castro has made since he took over temporarily from his brother Fidel in July 20096, and as the Minister of Information and Communications, Valdés is in charge of regulating information technology, telecommunications, postal services, information exchange networks, value-added services, the construction of electronic components, and the operation of radio, press, and TV channels. Following his appointment, Valdés fired José Antonio Fernández, Director of ETECSA, and Nelson Ferrer, Vice Minister of Information, for “failing to control the company.” However, according to industry reports, the appointment of Valdés, the concession to ETECSA and the dismissal of senior government officials are in response to the Cuban government efforts to bring the computing and telecommunications enterprises back under firm state control …” and restrict the telecommunications sector “… to foreign capital or to information and entertainment from outside the country … [and impose] … further restrictions for participation of foreign companies in the sector.10” It is evident that the Government of Cuba is concerned with the control, access, and dissemination of information across the country. The City of Havana has now grown to population of about two million people, but the water and sanitation system is over 50 years old, and was originally designed for a population of 600,000 people.12 The rest of the population is currently served with alternative means, known as “easy access” (fácil acceso), that include other options such as water trucks or common taps for drinking water, or latrines for sanitation, but these sources of water are usually from open flow systems typically contaminated by industrial waste, groundwater contamination, or saltwater intrusion. The main transmission lines and the distribution network have also deteriorated due to lack of maintenance, and the service life has been extended far beyond reasonable industry standards of normal, useful life, and losses in the distribution system are estimated at 50%. There are 8 wastewater treatment plants in the country, three of them around the City and Province of La Habana, but according to information from the Institute of National Hydraulic Resources (INRH), only 4 of the plants are considered “efficient” —none of them located around La Habana—and only 4% of the national effluent receives some sort of primary treatment. The rest of the wastewater is discharged into the ocean, or into other public water streams like the Almendares river, with minimal treatment. A severe drought experienced between 2000 and 2005 also affected the volume, quality, and availability of water in Cuba. It is reported that INRH operates about 240 dams and about 700 small dikes to store water as a source of potable water, but following the dissolution of the Soviet Union, Cuba lost its subsidies, and had to buy spare parts, pumping equipment, and treatment chemicals in the open markets, paying full market prices. As a result, during 2006 shortages of materials, spare parts, and water pumping equipment reduced the availability of water in the country, and worsened the already precarious conditions of the wastewater sector. The water supply in rural areas likely also lacks proper disinfection treatment. Information about the water sector in Cuba is limited. Official reports are focused on quantity, rather than the quality of the service. Thus, although Cuba reports a national drinking-water coverage rate of 95%, and access to sanitation of 94%, there is no current information about the quality of the water, service pressure, and hours of operation. In general terms, and during the years known as the “Special Period,” the water and sanitation sector of Cuba has deteriorated significantly, and major investments are necessary for water transportation and drainage systems, water purification and treatment, inspection and quality control systems, loss reduction programs, systems for the collection and disposal of wastewater, and renovations at the wastewater treatment plants. The Government of Cuba has used the media effectively to instruct the population on critical sanitation practices, such as boiling drinking water and disposing wastewater, which may account for some positive health indicators in the country, such as the low infant mortality rate of 7.27 per 1,000 live births and the long (77 year) life expectancy rate. Tourism areas do not report water or wastewater issues. The accumulation of all these problems prompted the Government of Cuba to call on the private sector and allow some participation in water and wastewater activities, and the Government of Cuba formed a joint venture partnership with the Spanish firm Aguas de Barcelona (AGBAR) to manage a portion of the drinking water system in the City of La Habana and the tourism resort of Varadero. Aguas de Valencia also works in Cuba as a private contractor under contract with AGBAR in water treatment activities in the same areas. While the participation of the private sector is a positive development and should be supported, there is very limited information disclosed about the terms of this agreement. The second major change in the future strategic direction of the water sector in Cuba is the reorganization of INRH, the Cuban government agency managing all the water resources in the country, which according to Law No. 245, has ceased as a central government agency, and is now under the direct responsibility of the Ministry of Construction. Reliable information on Cuba’s infrastructure is elusive. All data used for this paper comes from open sources and may suffer from inaccuracies, bias, and partial information. The purpose of this section is not to be prescriptive. The authorities in Cuba must take all the decisions related to the reform of the power, telecommunications and water sectors. This section simply tries to use the lessons learned in the reforms of infrastructure in Latin American and transition economies and applies them as a first approximation to the case of Cuba. 4. There is a need to increase utility rates, some sharply, to reach full cost recovery, but those rate adjustments have to be coordinated closely with policies designed to bring all prices in the economy closer to international prices; and 5. Rate increases will affect real incomes of the poor and must be coordinated with the establishment of a social safety net and the establishment of life line rates or other mechanism to ensure that the poor are not hurt too much by the necessary increase in rates of some services, particularly power and water. An infrastructure reform strategy should be developed by the authorities, and should address issues not only of the power, telecommunications and waters sectors, but also should deal with roads, ports, and airports.16 Consultants could assist in the formulation of the strategy. Other important activities would be visits by Cuban officials to countries that have reformed in Latin America (Chile, Guatemala, Peru, El Salvador and Colombia, for example) as well as countries in Eastern Europe (Czech Republic, Estonia and Poland, for example). This strategy could be completed in 3–6 months; periodic seminars involving civil society should be carried out to increase transparency. It would also be necessary to make a rapid assessment of the assets of the power company and the main water systems. The legal/regulatory framework for the different infrastructure sectors has to be developed and the laws enacted. A critical issue is the legitimacy of the authorities before free and fair elections are conducted. Once the laws are enacted, a multi-sector regulator should be established and staffed. The staff will require training on the job as well as abroad. Good possibilities for training abroad include the Public Utilities Research Center of the University of Florida (PURC), the U.S. Telecommunications Training Institute (USTTI) and the Kennedy School of Government at Harvard (specifically the course Infrastructure in a Market Economy). The regulator can also be supported by foreign consultants who would also provide on the job training. Additionally, partnerships under the National Association of Regulatory Utility Commissions (NARUC) with a U.S. state regulator could be a powerful instrument for enhancing the skills of the staff of the Cuban regulator. 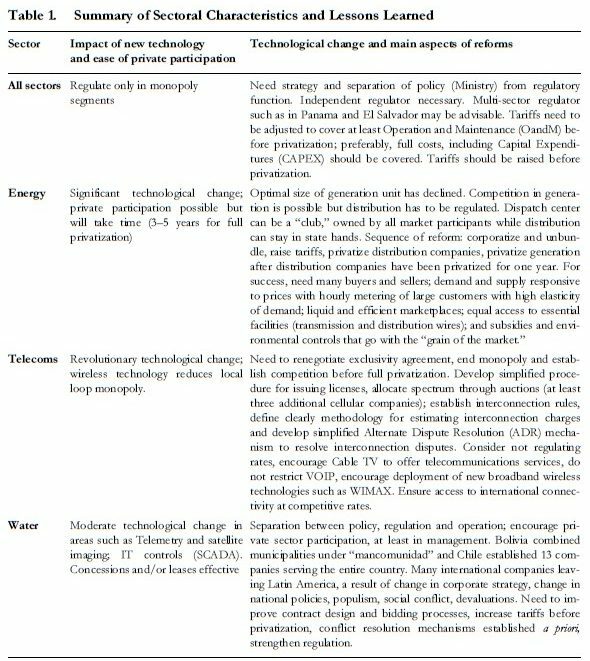 The specific reforms of the power, telecommunications and water sectors are discussed below. Table 4 summarizes the timing. 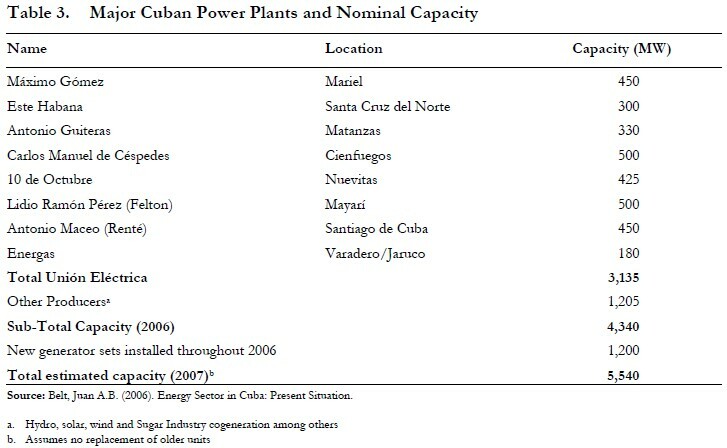 While in 2005–06 Cuba faced blackouts, the situation has improved markedly as a result of conservation measures, the installation of additional gas fired generation (100 MW) and the installation of over 1,000 MW of small gensets, although these gensets are a very high cost, short-term solution. The first priority for the authorities would be to introduce measures to avoid asset stripping and tunneling. The second priority would be to perform an emergency rehabilitation program of crucial infrastructure components to ensure the availability of power to critical facilities. Depending on the willingness of the managers of Unión Eléctrica (UE) to implement measures to increase efficiency and safeguard the assets, two programs of external support could be considered. • Under Plan A, the GOC would seek international support to bring in consultants to help UE improve financial management, billing, information and communications technology (ICT) systems, etc. For this plan to be effective, the managers of UE must be fully supportive. • Under Plan B, the authorities may choose to develop some form of performance-based management contract. These contracts should: (1) be awarded through an international competitive bidding (ICB) process; (2) they must give operators control to be able to manage the business, including reducing staff; and (3) managers and employees should get financial gains from better performance. The lessons learned form USAID’s study of operations contracts could be a valuable input for the design of a contract for UE. To achieve a competitive market, it is first necessary to unbundle the sector, i.e., separate generation from transmission and from distribution. 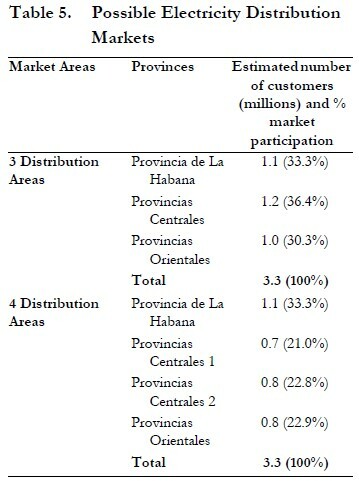 In a market the size of Cuba, three to four distribution companies would have to be formed. Each generation plant is of a sufficient size that could become a separate enterprise. Limits on vertical integration, i.e., prohibition of ownership of generation and transmission, and horizontal limits, i.e., maximum ownership of generation assets as a percent of total system generation, would be advisable. A complex issue is whether it is advisable to have a transmission company separate from the system operator. The different alternatives are discussed thoroughly in Hunt’s (2002) excellent book. One is to combine transmission and system operations in one company (Transco), such as the National Grid Company in the United Kingdom. This is also the model in Spain and Scandinavia. The other option is to separate the system operation into a separate organization, the independent system operator (ISO) and a separate transmission company (Gridco). This is the model in Argentina and in many parts of Australia. The determination of the most appropriate model for Cuba has to be the result of an intense dialogue between the authorities and consultants. The characteristics of possible distribution companies are summarized in Table 5. Privatizing the power sector is, by necessity, a lengthy process. The privatization process must be carried out competently and with a high degree of transparency, including consultations with civil society. The privatization of the power sector of Chile, the first such process in Latin America, took almost 10 years while the one of Argentina took two years. In the case of Cuba, where many of the necessary institutions do not exist, such a process would take 3–5 years. The sequence of privatization of the different components is also important. After the laws have been enacted and the regulator has been established, it is important to adjust rates before privatization takes place. The recommended sequence is to privatize the distribution companies first, after rates are at—or close to—cost recovery. After these rates have been market tested for a few months or a year, the generation companies can be privatized. Given that the main clients of the generation companies are the distribution companies, it is important that they are in a strong financial position before the generation companies are privatized. It is best to keep transmission in the public sector, and the system operator can be either a state-owned enterprise or owned jointly by all market participants, including the government. Introducing private participation in telecommunications is much easier than in the power or water sectors. Even in such conflictive countries such as Iraq and Afghanistan, there has been significant private investment in telecommunications. A country of Cuba’s size should be able to sustain at least three additional cellular companies. A spectrum auction and licensing for cellular carriers would be a priority. Also, licensing Internet Service Providers and potential cable TV companies, permitting them to offer telecommunications service, can be done rapidly. Cuba should not restrict in any way Voice Over Internet Protocol (VOIP). An agile mechanism for resolving interconnection disputes should be established following the El Salvador and Guatemala models.18 Foreign consultants can support the regulator in the auctions. Eventually, the Cuban government should consider selling its equity in the incumbent carrier after competition is in place, to avoid efforts by the incumbent to stifle competition. With a modern telecommunications sector Cuba can capitalize on its well trained population and become an exporter of ICT services. Introducing private participation in the water sector is difficult, but possible. It is remarkable that Cuba, a socialist country, has already done so in Havana and Varadero through a water concession contract with Aguas de Barcelona. It is also possible that the presence in these markets of a major international corporation may leverage—and further encourage —private sector participation, but it is also necessary to introduce discipline in the sector and prevent the possibility of corruption through asset stripping and tunneling. The water sector provides difficult challenges, but it may be reorganized according to market supply and demand characteristics following provincial and municipal boundaries, and according to legal issues related to the ownership and location of the drinking water sources and wastewater disposal sites. The water treatment and transportation infrastructure, the quality of the drinking water, and the proximity to markets should serve as guidance for the organization of efficient municipal and/or provincial companies managing the water sector, and providing water and wastewater services. The participation of the private sector in the water sector should follow the organization of these municipal utilities, and most importantly, the formulation of a national water policy, the enactment of a legal and regulatory framework, and the creation of a new regulatory institution, separate from any other government policy-making institution. The role of the regulatory agency should be initially focused on the identification and enactment of a set of rules designed to attract and retain the participation of the private sector. New pricing policies and rules should be designed on the basis of full cost recovery, efficiency, and equity. • The modernization of the wastewater treatment plants located in the interior of the country. Private sector participation can include a broad diversity of activities ranging from management and technical services, outsourced activities, water treatment processes, long-distance transportation, and wastewater treatment and disposal, among others. The main issue in the water sector is to avoid further environmental degradation of water sources that could have an immediate effect on public health, and provide adequate services of sewage treatment and disposal. 1. The opinions expressed in this presentation are those of the authors and do not represent the views of the U.S. Government. Comments on the paper were received from Stephen Tupper (USAID), Elizabeth P. Belt and from the discussant at the ASCE meetings, Roger Betancourt (University of Maryland). Only the authors are responsible for any errors that remain. 2. This section is based on Selowsky and Mitra (2002). 3. “UN Official: Cuba solved energy crisis.” The Miami Herald. July 4, 2007. 4. Assuming a production rate of 15 kWh per gallon of diesel, and a market price of $3 per gallon of diesel, the generation cost of these units is about $0.25 to $0.30 per kWh. Subsidies from Venezuela have been estimated at $2.0 billion annually. 5. The figures are presented in Cuban pesos given the difficulty of using a “correct” rate of exchange with respect to the U.S. dollar. 6. The information on this section is based on CAFC (2004) and Ricourt and Leyva (2006). 7. There are 90,000 cellular customers. 9. “Raul Castro fires Directors of ETECSA, Telecom Italia, and Copextel.” Havana Journal. October 3, 2006 (www.havanajournal. com). 11. The information on this section is from CUBAGUA/Instituto Nacional de Recursos Hídraúlicos (www.hidro.cu) 12. CAFC (2004). 14. Assuming an unofficial rate of 24 CUP per US$, the monthly cost of CUP 1.50 is only $0.06 per month. 15. “Onward into the Twilight.” The Economist, July 28, 2005. 16. In the discussion that follows, it will be assumed that the authorities have requested support from bilateral and multilateral donors. 17. Juan A. B. Belt was involved in those renegotiations. They are difficult, but possible.